You know how you really, really love your significant other? And how you like to remind him/her of just how important they are to you by sending sweet little messages to them every day? 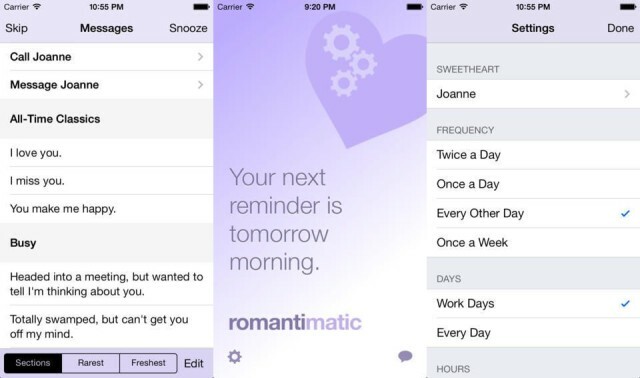 Well, now there’s an app for that, letting even the most forgetful, self-centered idiot make himself look like the most romantic person in the world. Behold, Romantimatic, probably the first app ever to combine pink and cogs into a single logo. Totally swamped, but I can’t get you off my mind. The more I look into this app, the more I think it must be a spoof. The most telling clue is that the settings contain a section titled “Sweetheart,” where you can change the name of your beloved and – presumably – add extra people. I’m now convinced that this is a prank, an art project, or both. What’s sure is that it’s a real app that you can buy for a real buck, and that if your lover spots it on your home screen, you may be looking for a new lover.